Ahh concealer, you magical thing you. I'm not ashamed to say that sometimes...I have used all four of these products on my face all at once. I mean, it's happened maybe twice, three times...who's counting. But they're all different, and all have their own uses, okay? Most days I get away with just one, but here's the rundown on my four favourites! Up first, the peoples favourite - NARS Radiant Creamy Concealer. This is just an all round goodun' in my opinion. Not too dry, not too slippy. Good coverage, but not too good, ya know? NARS is one of those cringe-worthy priced products in Australia (along with so many others, let's not go there) but I honestly think if you were going to splurge on a concealer, make it this one. It's just...lovely. An older favourite of mine is the Rimmel Wake Me Up Concealer, which I actually quite like to use as a brightening concealer, or to use for highlighting. This is mostly because I actually accidentally bought a shade too light for me, but it definitely has brightening properties and is a great under-the-eye brightener. It comes in super cheap too, a great one for the handbag. I splurged on the MAC Studio Fix Concealer last year when I was in New York, and even though I don't tend to pull it out as often as I should (no applicator - the effort I tell you), it is certainly my go to for days or nights where I really need my face to not budge. Some people find it a little drying, but I personally am lucky enough to not suffer from dry skin so it works perfectly for me. I bought a slightly warm shade to help cancel out any blue undertones under my eyes, but I also find it excellent at covering up blemishes. The last is a personal favourite at the moment, and I've been using it either alone or paired with the NARS offering. The Bobbi Brown Corrector in 'Bisque' certainly set me back quite a bit, and it did make me cringe when I realised how little product I got for my money, but once I saw it work it's magic I was sold. I had heard many good things about the Corrector and it's proved itself over and over. If you suffer from dark circles like I do, then you want to aim for a product that is going to cancel out the blue undertones that come with dark circles, like I mentioned before. This corrector is a solid peachy colour, much warmer than your concealer, but once applied, I find it absolutely eliminates that dark colour. My biggest problem previously was that my concealers were just making my dark circles look ashy, instead of covering them up, but the Corrector, as it suggests, corrects that colour tone! I never used to have concealer in my makeup routine, but now I almost can't live without it. What concealers do you like to use? Have you had any that have worked wonders for you? 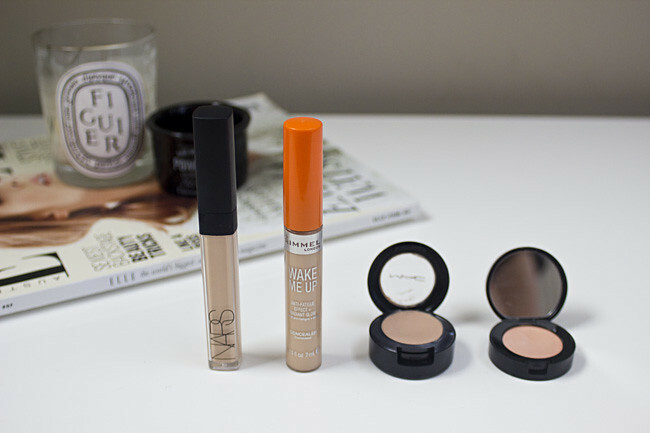 Awesome collection you have here - you've got a concealer for every need! I've heard pretty good things about the Wake me Up concealer but I think the shimmer puts me off a little - I'm actually not totally into under eye concealing (mostly because I luckily don't have under eye darkness). I have and love the Maybelline Fit me concealer which I've heard is the poor man's radiant creamy concealer! My favourite concealer is the MUFE Full Cover concealer. I am yet to find my perfect under-eye concealer that is hydrating enough but doesn't crease. I might check out the Bobbi Brown correctors.